Foresight is a process of establishing well-informed and future-oriented perspectives that help fuel, guide, and inspire innovation, strategic planning, and critical decision-making. The installation ‘Forecasting’ took place as part of the BARI (Brisbane Artist Run Initiatives) festival, to consider themes around disruption and water. The work was informed by rich conversations around disruption and water with Brisbane communities, in particular water scarcity and abundance and alternative futures to water usage. It posed open questions around the profoundly blurred distinctions and occurrence of disruption. 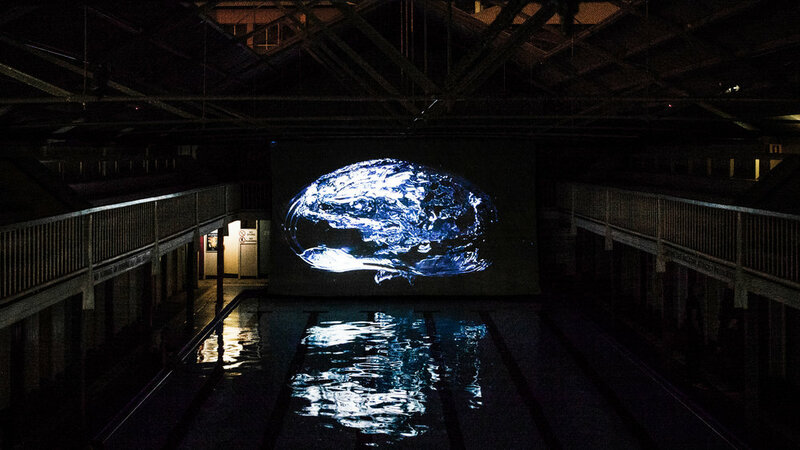 Installed in the heritage listed Spring Hill Baths, built in 1886, the installation aimed to open up a discussion about what our world could feel like, and inspire people to help shape it for the better in a playful and future thinking way when thinking about water. Communities where invited to participate within the installation by floating in the baths to consider these questions. It asked how urban and rural communities could evolve with their fragile environments, and with ongoing water shortages or increases in water that disruption brings. It sought to counter an emerging perspective where the future is no longer something we shape through positive insights or choices, but rather something confined to narrow perspectives or threats.